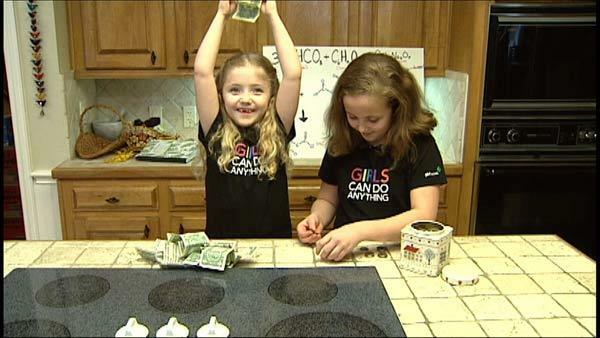 Abby Plunkett, 10, and Izzy Plunkett, 7, started a business selling their homemade bath products. The sisters share their secret DIY recipes. It all started with a science experiment on what makes the fizz in a bath bomb. "It was simple chemistry, we looked it up," said mom, Jennifer. "We found our products at a local grocery store and made our first batch." "They were lots of fun to make. And we had a whole lot so we started selling them to friends, family and neighbors," said Abby. And "Blossom Sisters Bathery" was born. The girls set up shop outside a cafe and sold their products to the general public. "It is the girls' business, they made decisions. I am there to help them," said Jennifer. "Prices are very low and competitive and were made by two little girls. The Izzy's Fizzies, which is a bath bomb, you need just one for each bath, we only charge $3 and in the store these can range anywhere from $5 to $8. Then you've got soaking salts. Depending on the size of the jar, it can be $3 to $5 and that would easily be $20 at a specialty store." Right from the start, both sisters agreed, they wanted to save the money they made for college. "All the profit the girls make will go directly into their college fund," said Jennifer. "So we have enough money for books, and we have a good college," said Abby. It hasn't taken long to see results! "It does add up. It has added up to about $500 in the last nine months. When they do go to school and they see that $5,000 in the bank that they could go spend. They know how much work it took to earn that $5,000 they are not going to go blow it on coffee shops and partying," said Jennifer. The girls wanted to share a few of their top secret recipes, so you can try out their products at home. Mix together the goats milk and epsom salt. Add the essential oils and shake again. Mix all ingredients together and shake it up. Use a scoop or so to each bath to help aching muscles. Mix baking soda and citric acid in bowl. Add one scoop of coconut oil and work it in (like a pie crust). Then, add 1/4 cup of sea salt. Then, add the essential oils. you can add food coloring if you would like - just about 4-5 drops. While mixing have someone else spray water on the mixture. When it gets to be the consistency of sand castle sand, stop. Then, put the mixture in molds and quickly put the molded shape on a piece of wax paper. Allow it to dry for about 24 hours. Add to a bath for a fizzy, relaxing treat! Don't feel like making these on your own? The girls are taking orders and can custom make just about any scent you like. Email them at blossomsistersbathery@gmail.com.